From now on you do not have to keep so many secondary colours in stock. For with the Fremix you can effortlessly mix colours and additives. Jac. de Vries Fremix ink mixers are ideal for mixing small quantaties of ink (up to 5 kg). The ink can itself is used as mixing hopper. Quickly and effortlessly a good, uniform mix without air bubbles. Components can be weighed directly in the can. Suitable for vacuum cans of 1 and 2.5 kg, can be modified for screw cans up to 5 kg. 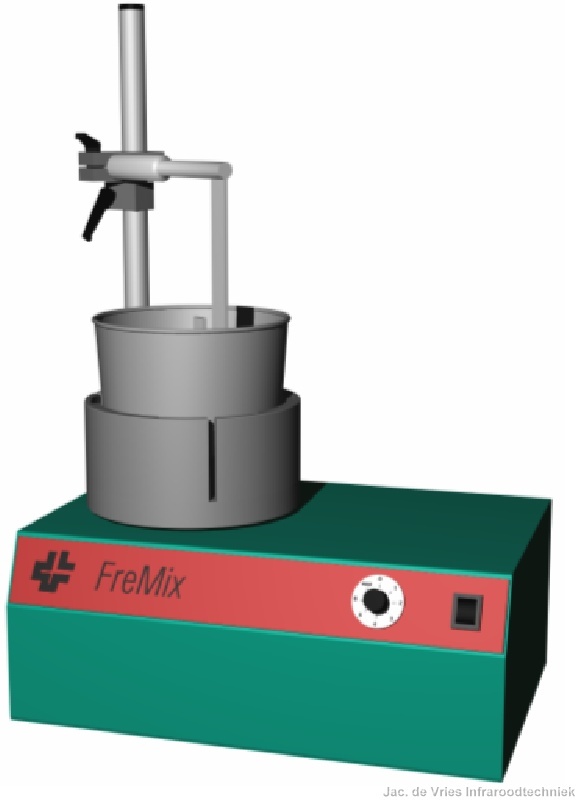 The FreMix is driven by a compact electric motor with continuous rpm control. A fixed speed version is available as well (70 rpm). Dimensions 290 x 425 x 180 mm, weight 18 kg.